Circus art is so diverse it is impossible to define it with a single sentence.Circus has been with us since ancient times with centuries of well-documented history in the modern age as well. Beyond its obvious merits in entertainment, it has a significant intercultural, sociological, and also economic value. Circus is alifestyle, a unique division of performing arts that is able to address and entertain all generations at the same time. During the past two centuries circus has undergone previously unprecedented development as the industry became more and more complex and colorful. While traditional circuses remained present, a new wave of traveling circuses, new generation circus productions, nostalgia circuses, stunt circuses, street art performers, thematic acrobat-shows, and contemporary and progressive circuses have become increasingly popular. Today, community and youth circuses and free-time circus schools have also become an integral part of circus arts, ensuring a well-trained new-generation of artistes and consequently the further development of circus, while providing a vital toolbox for enhanced social cohesion, job-creation, solidarity, and intercultural cooperation. 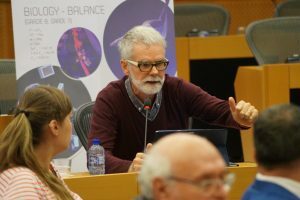 As circus developed, both institutional and legislative systems have failed to adjust the environment to the new needs and requirements of the circus industry. At the same time, some representatives of circus arts have not adapted sufficiently to the demands of this new era. 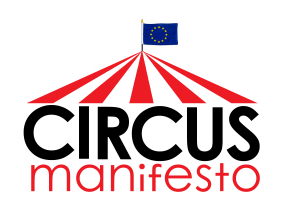 The present “Circus Manifesto” gathers the needs, suggestions, current challenges and future opportunities of all European circus stakeholders including circuses, ensembles, amateurs and professionals alike, circus schools and community circuses in one document. 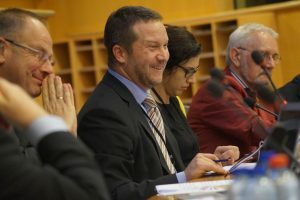 This paper is based on the ideas, comments, and speeches of this Manifesto’s supporters,and on the presentations from the conference organized in the European Parliament on 18. 10. 2016. -Circus industry provides tens of thousands of people with jobs and millions with quality entertainment. Circus arts are unique in their ability to entertain all generations, an entire family at the same time. -Circus is a form of art that is constantly pushing the physical limits of performers and promotes a sense of community while strengthening the rules upon which our everyday communities are founded. Circus is one of the most important, defining artistic forms in Europe thus it must be treated on an equal footing with theatre, opera, dance arts, or ballet. -Circus arts are an integral part of European culture and economy, therefore they must receive commensurate recognition and attention. 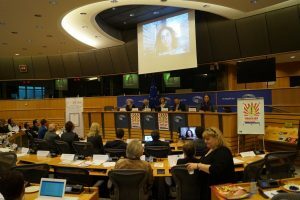 – The last comprehensive EU study discussing circus arts was conducted more than thirteen years ago. It is now time for a new European Commission paper evaluating the current situation of this 250 years-old industry. -Our aim is that circus arts receive recognition on the international level proportionate to the significance of their place in the global culture. Our aim is that universal circus arts become part of the UNESCO Intangible Cultural Heritagelist as soon as possible. 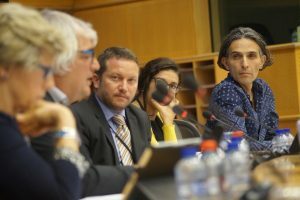 – We call upon all member states of the European Union – if they have not done it so far – to officially acknowledge circus arts as part of the European culture. Likewise, we call upon them to include their circus arts on their respective list of Intangible Cultural Heritage. -We propose a “mapping” of the European circus industry that indicates, presents, and analyses how holistic values of modern circus arts manifest and what impact they have on communities. 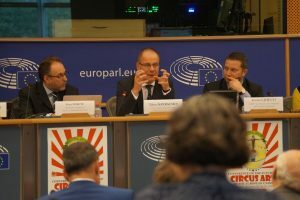 All EU member states must strive that all circuses with different styles face the same conditions everywhere – including the availability of financial resources. 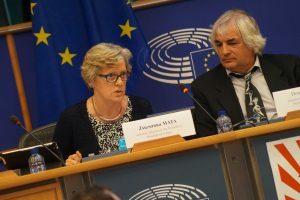 -Further efforts are necessary in order to harmonize the legal environment in Europe to alleviate free movement and smooth cross-border operation of circuses. Similarly, rules applying to public- and workplace safety should be better harmonized. A method for the efficient standardization ofEU laws concerning traveling circuses must be elaborated. 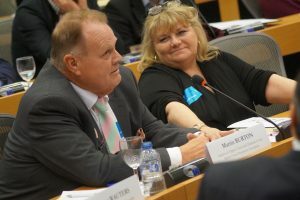 – Cross-border mobility – one of the main characteristics of circus – commands us to view circus in a truly European perspective with a unified European legal environment. The question surrounding visa-applications of artistes from third countries remains to be unresolved. We are calling on decision-makers involved in the respective trialogue procedure to accelerate the adoption process of the case. -Circus arts have developed immensely in the past 250 years, proving that renewal is always possible while keeping traditional values at the same time. However, every branch of circus arts is built on the foundations of traditional circus. -Animal shows are legitimate and valuable parts of traditional circuses enriching our collective European culture. Circuses with real cultural value and their animal trainers will always respect their animals and consider them as partners. -We support the establishment of a strict legal system in all countries focusing on animal welfare, animal husbandry and training in circuses. Within this legal framework, however, circuses and artistes must be free to choose whether they wish to work with or without animals. 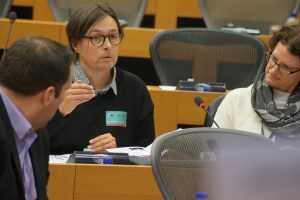 -The unconditional acceptance or a general ban on animal shows are both inconceivable in the absence of a unified European legislative environment. This is why it is indispensable to differentiate between responsible circuses that respect the rules and legislations in force and those that ignore both written and unwritten rules. 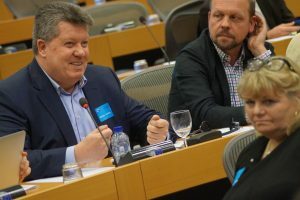 – We support the initiative that puts forward the establishment of an independent body that would rate – recurrently as well – European circuses and ensembles in the framework of a special, jointly developed quality assurance system, the “Big Top Label”. 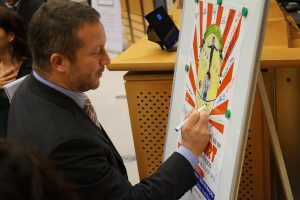 This unique accreditation system, proposed by István Ujhelyi MEP, would guarantee a quality threshold of circuses taking into account a wide range of factors and conditions including the enforcement of safety and animal welfare regulations, the respect of workers’ rights, the level of professional education of employees and their further training opportunities, the promotion of traditional circus values, the ability of progressive renewal, or the willingness to take social responsibility. Thus the Big Top Label (the Michelin-star of circus arts) could act as quality guidance both for the circus community and authorities granting permissions for circuses as well. -The experience of performing on a circus floor is no longer a privilege of onlyprofessionally trained artistes. Thanks to social and youth circuses, today everyone can be part of the magic. This is the magic of circus that is able to deliver crucial social messages in a unique manner. -Currently there are more than 500 social (social = facilitating social integration) circuses in 70 countries, among them more than 200 in Europe. Cultural and educational support for these circuses must be increased with targeted development programs. -We need tailor-made platforms in order to strengthen dialogue and exchange of views and experience between various branches of art forms. If necessary, EU institutions should act as moderators during the process. -Circus pedagogy is an important part of physical and mental training of young people, improving even youth unemployment rates. Therefore it is absolutely necessary that circus schools and social circuses receive funding under a strategic development program that include state subsidies as well. 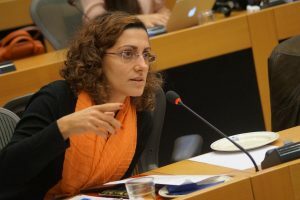 – We support initiatives that aim to achieve that social- and youth circus pedagogy becomes an officially recognized subject in higher education with quality curriculum. Similarly, we have to promote methodologies of circus-therapy: scientific research and statistics regarding this topic must be conducted. -Cultural and creative industries (opera, theatre, dance-art, live music, circus, etc.) provides more than 1.2 million jobs in Europe alone. 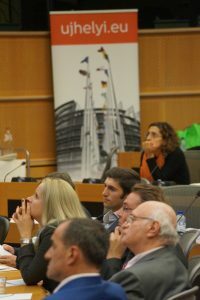 This means circus could play a crucial role in relaunching and reviving our European economy. Studies and statistics show that those who experience culture and cultural performances regularly work better and are happier in general. -Circus arts are an integral part of the tourism sectorwhich is one of the driving forces of the European economy. 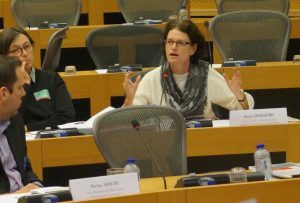 We are calling for a tighter cooperation between stakeholders of the tourism sector and the circus industry. 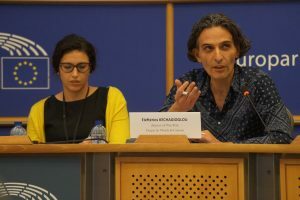 -2018 will be officially the European Year of Cultural Heritage providing a platform for a wide range of cultural programs and initiatives, while the same year will mark the 250th anniversary of modern circus – connecting the two events is vital. 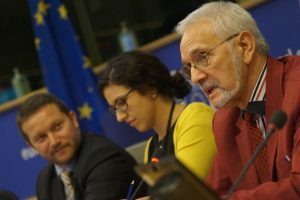 – We propose an active cooperation between organizing institutions of the European Year of Cultural Heritage and those preparing the 250th anniversary of modern circus arts in order to provide circus with the attention and recognition it deserves due to its distinguished place in European culture and its 250 years-long history. Circus art, in all its varieties is a valuable and remarkable part of the European culture. The traditional circus is a blend of organised artistic displays and musical entertainment in which acts featuring acrobats, clowns and domesticated and wild animals, are performed in the same ring in turn. In the past few decades modern new generation of entertaining circus performances started to run; the externalities, the visual world and the display of animals in the circus art has been changed, but not the function and not the outstanding cultural and economic value. Circus art is still one of the most influential artistic products, which plays a key role in the entertaining and tourism industry and gives a perfect evidence of cultural coexistence. To keep it this way, in Europe we need strategic thinking about traditional and new generation of circus art and we need wellcoordinated development. 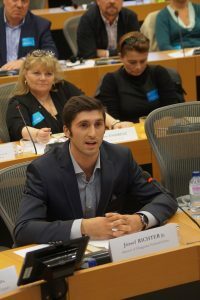 was the initiator and also the host of the event – wanted to bring closer the European decisionmakers and representatives of the traditional and the new generation of circus art to find out together: how we can preserve traditional circus values, how we can assist in the development of new artistic ways and strengthen the cultural cooperation between the circuses and their associated institutions. This article summarizes the presentations and comments in a chronological order. “The International Association of Circus Historians defined the term ‘circus’ in 1988 as ‘the meeting point between an organised artistic program and a musical company, with acts of acrobats, clowns and tamers of wild and domestic animals performing inside an oval-shaped esplanade’. To us, however, in this circle, it needs no proof; circus arts are so colourful it is hardly possible to define them with a single sentence. Circus is a form of art and culture with centuries-long history. Its significance stretches beyond pure entertainment; it bears intercultural, sociological and economic importance as well. To put simply, circus is a unique lifestyle. Circus, in all its varieties, is an integral and valuable part of our European culture. It is a great honour for me that so many of you have joined me today in order to discuss the current situation of circus arts, while it is imperative that we keep an eye on future opportunities and challenges. 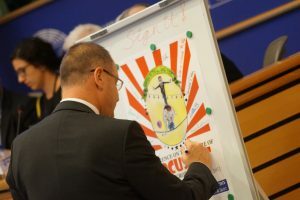 This is a defining moment as circus on its own right is a debutant topic in the European Parliament. I personally have profound respect for the art of circus. This is why I am extremely happy to embark on this journey with you and to represent your interests both here in Brussels and beyond. Make no mistake, we have a lot to do. Unfortunately, we know very little, if anything, about the problems and demands of circus groups across Europe. The latest comprehensive study was conducted more than a decade ago.Ten years is a long time, circus has changed significantly since then. Besides traditional circuses, a modern wave of new generation circus spectacles has been gaining ground recently. These could take the form ofstreet performers, social circuses, youth circuses, or circus schools, but they have two things in common: they are all very close to my heart and are immensely valuable from a touristic point of view. The latter ones even play an especially important role fostering social cohesion and contributing to lowering youth unemployment as well, but we will come back to this a bit later. 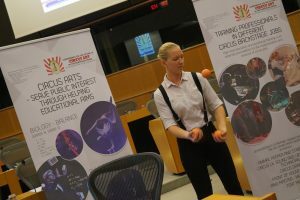 We barely talk about circus arts here in the European Parliament or in any European institution. We have the tendency to procrastinate answering certain questions. 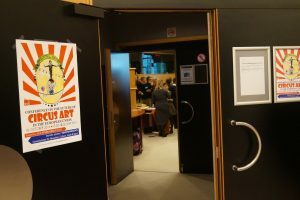 A concrete example is the issue of visa-concessions for traveling artists or artistes from third countries –a case I supported wholeheartedly as the rapporteur responsible in the TRAN committee. 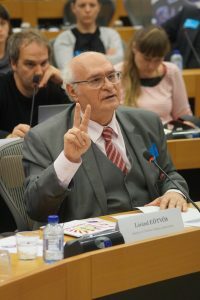 The visa package is now in the trialogue phase, we are progressing only slowly as the refugee crisis and the threat of terrorism both strengthen isolation instead of openness.In recent years, my colleagues have repeatedly submitted questions to the European Commission about animal welfare in circuses, calling for a general ban on displaying animals in circuses altogether. The Commission, however, made it very clear that this issue remains a national competence of member states, thus the Commission will not prohibit such performances. This is why animal performances are entirely banned in some states, while partially or fully allowed in others. 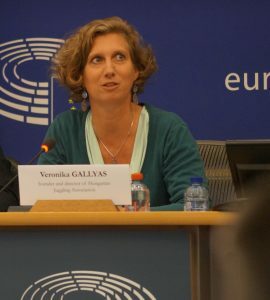 Nevertheless, animal welfare cannot be swept under the carpet, we have to find the compromises that are satisfactory for all stakeholders, including the audience and animal rights organisations as well, whose worries are often legitimate.There is an obvious breakline between the worlds of traditional circuses and those animal-free new generation ensembles. My personal view remains that animal shows are an integral part of the circus art as we know it in Europe. At the same time, we must meet the demands of new generation circuses as well, ensuring the wellbeing of animals while respecting traditions and cultural values. This is why I hereby suggest the establishment of a special quality assurance system that could guarantee that both side’s concerns and priorities are fully respected. Circus arts do not only represent a cultural value. They play a crucial role in international cooperation, in strengthening intercultural diversity and social cohesion, in skills development for young people, and last but not the least, they help us think as a community. Circus arts are becoming an increasingly important driving force for the sustainable development of the tourism sector. As Vice-President of the TRAN committee responsible for tourism,this trend is something I can welcome and support genuinely. There is far more to circuses than just spectacles and some oval stages ‘under the Big Top’. Today, I would like to put forward three initiatives regarding the future of circus arts. Your help and contribution will be vital to the success of our project. This is our common endeavour. 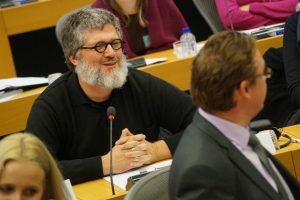 First of all, I intend to officially call upon the Commission to prepare a new comprehensive study and analysis regarding the current needs, challenges, and problems that modern circuses face today in the European Union. Second, I shall propose the establishment of a quality assurance and accreditation certificate that would rate ensembles on their traditional, cultural, and artistic value, with special attention on how they meetanimal wellbeingstandards.Let us call this certificate the “Big Top Label”, the Michelin star of circus arts, an independent quality assurance system guaranteeing quality circus art and no maltreatment of animals. I will send an official proposal concerning this issue to the International Organization for Standardization, but I am happy to initiate it individually as well, guided by your professional cooperation of course. 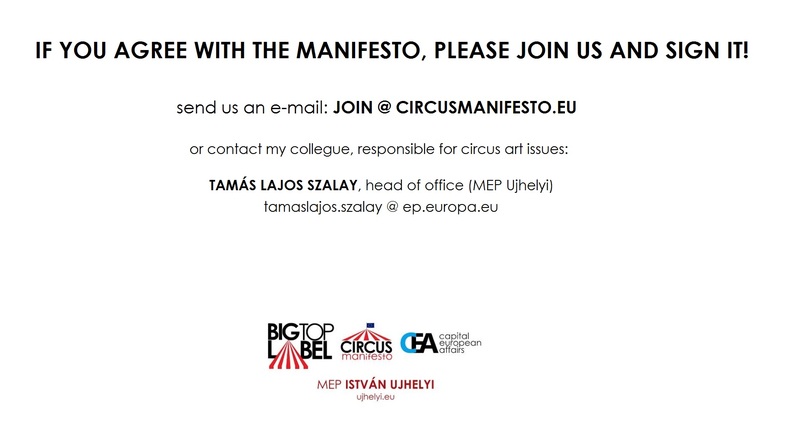 Finally, I would like to prepare a “Circus Manifesto” about the present situation and potential future challenges of circus art. This could be the guideline for European institutions and circus stakeholders alike. My suggestion is that we prepare this manifesto together, with this very circle, or a similar but broadened one. I would like to kindly ask all of you here with us today to propose what we should include in our Manifesto so we can conclude on it in the near future. 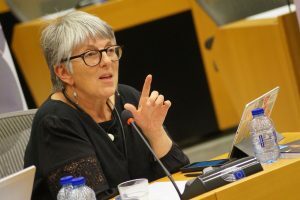 “(…) I’m in a very difficult position, because in my cabinet and in my services there are no vested interest of circus art and artists, which gives as the advantage of not having conflict of interest. But on the other hand it caused slightly helpless situation when we asked for background materials about circus art at European level. Because you may know that, every element of my portfolio belongs to the so called ‘principal of subsidiarity’, that means that just like education or sport, culture belongs to the exclusive competence of the member states. 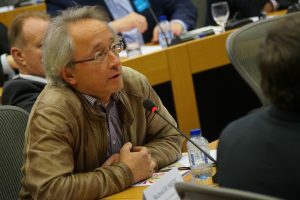 So circus art also belongs to the competence of the member states, however we know that if there is such kind of artist mobility at European level, so circus art is one of the most representative branch of the culture in the mobility of artist. Let me start with the creative cultural industry, just because partlyit belongs to my portfolio, however we are missing an overarchingstrategy or conception of culture and creative industry that European level. Why it’s quite clear that in a sharp competition among various regions of world economy that is one of the strongest point of Europeaneconomy is that we have rich tradition of economic activities, artistic activities based on our cultural heritage and circus art is part of that rich cultural heritage, because circus is ‘per definitionem’a European invention at least for us as we know it. I know that there are other traditionsof circus art as well, but for us this organic part of European culture can help overcoming economic difficult is as well. Ernst &Young – which you may know it’s an adviser company – made an analysisof the cultural and creative industries and it’s their data that performing arts, dance, theater, live music and circus arts provides 1,2 million jobs in European economies. Which means that, it can have and it actually has quite strong contribution to the European economic revival or the European economic growth. That’s why I think if we take cultural and creative industries as a whole, we have to elaborate a coherent conception of cultural and creative arts, where circus arts has its own place and regarding that circus art has at least two faces: one is supporting the maintenance and continuation of a great cultural tradition and on the other hand innovating that tradition with cutting edgetechnology performance and artistic achievements. We can build on both, as a strong element of future economic growth. We have a very good occasion for reinforcing our cooperation with the people of circus art and that is 2018, the European Year of Cultural Heritage. 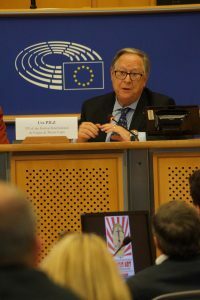 Which I think is an excellent opportunity not only for us, for the parliamentarians or members of the European Commission, but for you as well to show that our cultural heritages are treasures. It’s also a great opportunity to think about how we can contribute to economic revival, to cultural revival of Europe.How can we shape the circus art – and the definition of circus art – to built up a ‘European circus art’, I mean finding the meeting points, helping mobility of artists, making the circus art even more international (cosmopolitan or multinational as you wish), because I think circus art can show us good example how to add just national heritage and cosmopolitan approach in a good and an efficient way.So,that is why I would offer you a cooperation for developing new ideas for the European Year of Cultural Heritage in 2018. However, it is a European year, but almost all of the important initiatives must come from local, regional or member states level, because the Commission itself cannot organize a European, uniform something, which would be awfully boring, I think. So we would rely on your contribution to that and let’s think about it. 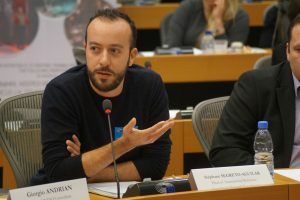 And István mentioned the Commission’s responsibility to help you in establishing the artist mobility and he also mentioned that there is a trialogue on that issue. 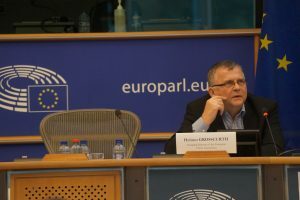 I hope, that we will find a good solution in the near future and a borderless Europe, a borderless EU, a more or less coherent Visa-policy for the EU member states will be available and will be present for you as well.So, I think that this event is only a kick-off meeting and I hope that we can work together in developing new ideas, conceptions, how to make the conception of cultural and creative industriesmore multicolored, more coherent and more complex, because I think that is thebest offer we can give to other regions of the world and we can prepare jointly for the European Year of the Cultural Heritage in 2018. “(…) As you see on my label, I’m a ministerial commissioner for circus art. 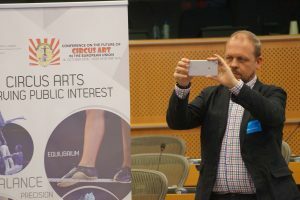 Which is a very funny thing, showing that Hungary takes circus art so seriously, that even announced a ministerial commissioner for circus art. It’s because we would like to built a new circus art centre in threeyears time, but before we build this new centre, we should know what we would like to do in this centre, why we doing that and how it will work. So, we are now in a research position, we brought with us five posters, which showing different subjects in which subjects we are very strangely and strongly looking for different answers; so during the conference please take the opportunity to read them and if you have questions, we can discuss them in the interval time. 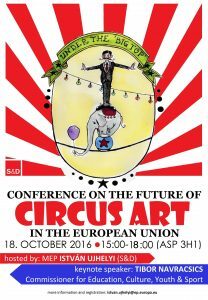 But I would like talk about the responsibility for keeping, securing, and renewing the circus art in Europe. Classical circus: a way of renewing classical circus art could be to find a good content suitable for sending social messages. So, I think we can learn from new circus; if we would like to renew classical circus, we can spread social messages through classical circus.Let’s see what happened in the last 200 years. Circus has undergone an enormousdevelopment over the last 200 years. And not only the circus: theater, opera, modern and classical dance, everything has grown and changed in the last 200 years. In the beginning the circus was the place to present interesting and unusual natural qualities, skills and technical innovations. Butwhat was the reason for the major changes to the 200 years?First, technical development, because the circus is notlongera place where the latest technician wonders could appear. Second, television communication spread so sporting and other human achievements arrived to the people much easier way. Third, the social sensibility has increased enormously in society. Also the importance animal welfare grew in the society and developed other branches of performing art in the last century. So, what became as result of those profile cleaning. The first, that improving the human performances strong and more elaborate, more harmonic production with creator aesthetic impact arrived in the circus. Also the animal acts improved, because only harmonious men and animal pieces would be and can be shown in the circus. Also influence of other arts arrived: music, sound, lighting technology, even the video technology arrived to the circus. The situation today in one hand, is that the circus grown from being a part of entertainment industry, to an independent branch of performing art. Circus has became branch of the arts stretching the limit of human abilities and aesthetic elements able to send social messages. Circus now should be equal totheater, opera, dance, classical music and ballet. I believe, that they areequal. On the other hand we have some problems, because many people have turned away from the circus. Important classical circuses closed down in Europe and overseas recently. I just discussed with circus-friend people and they are afraid to go public places and lots of people not going to circus because they are afraid of terrorism. The circus is not attractive enough for the teenager generation. There is a lot to do for changing the feelings in people’s mind about circus. So, we have in one hand lot of achievements which give us responsibility and on the other hands we have warning signs which obligate us to rethink and checkthe possibilities for development. What are the area in which area we can do something? I think first time we have to make training stronger. Training in school level, artist training is school level, we should give master classes for children for traditional artist families. In the traditional artist families new generations are growing, and with time we have to give support for those children to bring them into school and give extra lessons for them.And also we have to make sure that we train the backstage jobs, the professionals who serving the circus. So, all the backstage job we have to lift up with the training.We have to clean up the story with the animal acts. Only actssymbolizing harmony between human beings and animals should be performedin the circus. We going in this way, but we should clean up that situation. There is a big need for animal acts. In our circus in the Hungarian National State Circus, if we have phone calls from the audience, 80-85 percent of these calls are asking:what sort of animals do we have in the program.So, there is a big need for animal numbers in the circus. Demonstrating and strengthening social benefits, common cultural space for families and different generations – please think of it -, circus is the only art form and venue where all four generations going together: small kids, teenagers, parents and grandparents. The whole family visits one cultural space. We should keep this. Circus is a mediator for social messages. I believe that every circus art got social messages. Balance, respecting each other, trust, these are all questions which symbolize true circus acts. 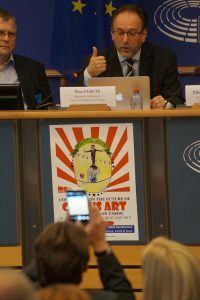 We should use them and we should spread these messages (…) Circus art is a carrier of messages of social responsibility. Circus is not nearly a private business anymore, but a communal, cultural and educational activity that should enjoy public support, accept founding from taxpayer’s money and receive social recognition. I believe in this. “(…) I come from many generations of Hungarian circus family, I live in the UK since 47 years, I’m a British citizen. I decided I believe today in here the idea to talk about the future of the circus future of the new generations. Instead of telling you what I think the future holds us, I would like to tell you a little story of my life – to tell what really the future of the circus is. When I was a young guyat 16, I used to practice many hours and I have no skin on my hands from the trapeze and have only one meal a day. I met an old circus artist Mr. Molnár and his wife, he was very respectful person, verywell respected artist he was. And he came to me and said: ‘circus is finished’. Pardon? – I replied. It was about 1961, and he told me: ‘no more future, circus has done’. I was 16 years old and I could very easily give in. ButI didn’t. I carried on, worked very hard and travelled the world. I did everything in circus, including training animals, tigers, elephants, horses, chimpanzees, kangaroos, I did trapeze, trampoline, and springboard. Eventually I had an impresario in London, which was quite successful and 25 years ago I’ve been asked to manage the tower circus of Blackpool. The rest is history. We have been running the Blackpool Tower Circus for the last 25 years. 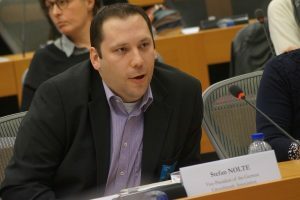 I just wanted to tell you when we are talking about the future of circus: how wrong Mr. Molnar was. There was future then and is future now. I have to tell you: I sleep, drink, eat circus. Circus is my religion. Circus is my passion and I’m very much looking forward to 2018 when our industry will be 250 years old.The origin of the circus comes from the UK,Philip Ashley created the first circus in 1768. Now, we will plan lot of celebrations and happenings in the UK for 2018. We hope we’ll create very good festivals and shows. 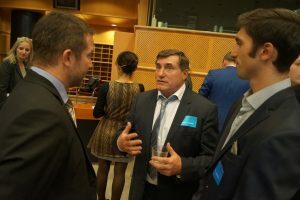 “(…) I’m very happy to have heard the words of Mr. Ujhelyi and Commissioner Navracsics, which are in many aspect very parallel to our thinking, to the thinking of organizations in the federation, but also as I know of the thinking of many circus peoples. So, we are having the same ideas, I speak specifically about the fact, that you are appreciate the quality, you ask for quality and you would be ready to give a certification for quality. That’s what circus needs. So, in the future, the good ones may survive, and the others must find solutions: either change or they will not be part of the future. That’s just my immediate reaction for what you said. With our federation, we support all forms of circus: circus in general, traditional circuses, new circuses including social circuses and circus schools. Of course, with the association and the federation we support traditional circus strongly, because we are on that field of traditional circus and that one is based on the three columns: acrobatics, comedy and animals. Prince Rainier of Monaco decided in 1974 to create a circus festival just based on these three columns, because he wanted to give support to the circus people. He left this business, he left the circus art and he saw that some of the circus families needed to be helped. And being Prince of Monaco he had good possibilities in doing something for the circus,as Monaco has great platforms for entertainment. Now this year we marked the 40 year anniversary of our festival, which still bases on the idea of Prince Rainier and also with the aim to give support to circus arts. (…) Circus debuts in the EP for the first time on a conference, this is wonderful. Let me introduce the Federation Mondial de Cirque in the brief time given. Our organizations the first worldwide non-profit circus organization founded in 2008 in Monaco under the honorary presidency of Princess Stephanie, continuingthe work of her father Prince Rainier. The visionary idea came that the sector needs professional representation. Our organization includes only organizations, no individual circuses. (…) we have full and associate members, and other supporters as well. We are a big organization with he objectives to promote and preserve circus arts and culture, represent members and participate in circus related projects and provide professional support. Promotion for us first of all means that we promote circus arts for them to be accepted and respected part of culture. 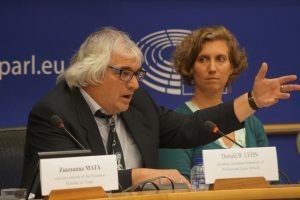 The European Parliament accepted in 2004 a resolution with one sentence saying that traditional circus with animals forms part of the European cultural heritage and culture. 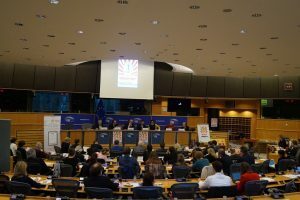 This is an indication for all European countries to think about the role of circus and to urge the national governments to accept circus as culture legally – as it happened in some states already. Our work include on international level the promotion of circus with the world digital library of which we are official partners of.We now have a lots of historical circus photos and images, documents put on the website which is open for everybody. 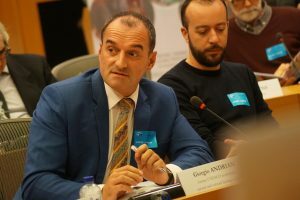 Five years ago we started our UNESCO project that Giorgio has mentioned already with the aim for a multinational application to get circus art listed in the register of intangible cultural heritage. As a precondition the applicants already have to have circus art registered in their own national inventory. This is a very difficult and large procedure so until now only two countries have reached this: the Netherlands and Hungary. We created the World Circus Day seven years ago. This year more than 50 countries with 220 different circus events celebrated the date. Representation for us means serving the interests of circus community on all levels. 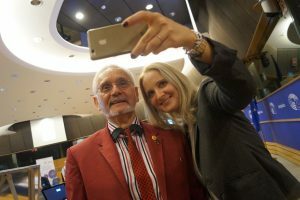 We encourage the amendment of national legislations, we nominate circus ambassadors who hallmark the best ways in the circus industry and help in policy-making. We also take part in the preparation of legislation like when we had the chance to be the part of the working group for the traveling visa. We also offer professional, technical and legal support, we have a lot of professional collaborators, lawyers and scientists, veterinarians, biologists to help our work. We see a strategic partnership with any event which can make a positive influence on our sector, so we are always ready to cooperate. (…) Next steps: we have concrete projects for the future, the Federation is ready to collaborate with all organizations, we are happy to contribute to the future of the circus. “(…) The circus is a wonderful world, with all the traditional circuses, contemporary circuses, with social circuses and with circus schools. I had a lot of different circus experience. I was juggler in the first two Cirque du Soleil, it was a wonderful experience. I was also working with animals which is wonderful, but you have to respect them. Circus is a wonderful world where we can experience a lot of different things.